Ganesha’s Sweet Tooth is a fantasy folklore loosely based on Hindu mythology. It’s a charming and engaging tale with very colorful and whimsical illustrations. And normally, I am not one to obsess over art and illustrations; I usually ignore them. Unless they jump out at me. These ones did, and I loved them. Every page is full of bold, beautiful and vibrant color. And both of us ( me and my 4 year old) just flipped pages in awe and wonder, back and forth, before we even began reading. Coming to the story – I found myself ‘smiling out loud’ (if that is a thing) as I followed this kid-friendly adaptation of the story of the Hindu God Ganesha, and how he came to write the Mahabharata (the great Hindu epic). 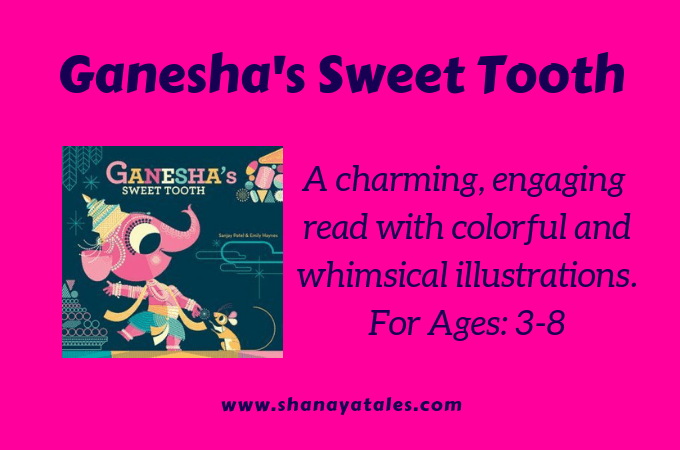 This re-imagination does take certain liberties with the tale of Ganesha, to appeal to the younger audience, I guess, and I am usually wary of books that alter religious/historical myths, but I did not mind this story one bit – it is funny, charming and mystical. But the thing I LOVED about this book ( and this might be my particular situation only) – is that I can read the ENTIRE BOOK to my son UNDER 10 MINUTES and HOLD HIS ATTENTION for all of that time. This is a big deal for me. My son is very easily distracted, and while he loves story-time before bed-time, he usually dances around as he listens. It is very difficult to get him to sit still. And it drives me nuts! With this book – he is completely engaged. He loves to see the illustrations as I read, and the text is not too much, and easy to follow. He also loves the fact that we finish an entire book in one sitting. This is important to him, and it is not always possible with every book. For instance, the other book that we are reading – Charlie and The Chocolate Factory – if we attempted that in one sitting, we will be there all night. Bottom Line: If you have a kid between ages 3 – 8 – GET THIS BOOK! This will also make an excellent gift for a kid in that age range. As it happens, I got this as a gift from my cousin (she has wonderful taste in books – she was also the one who sent the first Harry Potter book to me and my sister – can’t thank her enough for that!). Have you read this book? Did you love it as much as we did? Do you know of any good picture books for kids in this age range? The ones that are interesting, funny, yet short reads? If yes, then please do share them with me in the comments. I’d love to hear from you. I love the book cover. Hope you find many such books that keep your son riveted. Totally getting it for my son!!!! Thanks a lot! Happy to read your take on the book, i was imagining how your son was hooked to it. It is indeed a blessing to find such interesting prints. Unfortunately, i don’t have any examples myself.